October 19, 2017, 4:00 – 7:00 p.m.
October 20, 2017, 8:30 a.m. – 6:00 p.m.
October 21, 2017, 10:00 a.m. – 3:30 p.m. 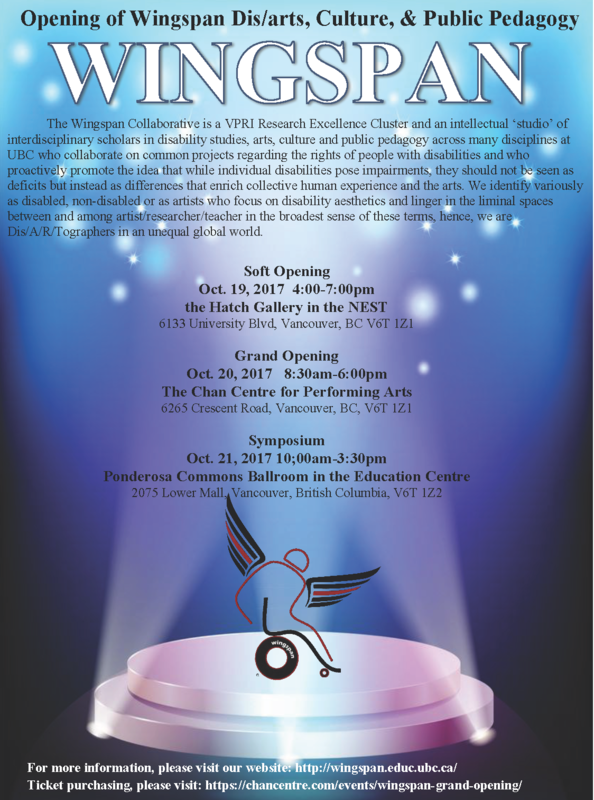 The Wingspan Collaborative is a VPRI Research Excellence Cluster and an intellectual ‘studio’ of interdisciplinary scholars in disability studies, arts, culture and public pedagogy across many disciplines at UBC who collaborate on common projects regarding the rights of people with disabilities and who proactively promote the idea that while individual disabilities pose impairments, they should not be seen as deficits but instead as differences that enrich collective human experience and the arts. We identify variously as disabled, non-disabled or as artists who focus on disability aesthetics and linger in the liminal spaces between and among artist/researcher/teacher in the broadest sense of these terms, hence, we are Dis/A/R/Tographers in an unequal global world.